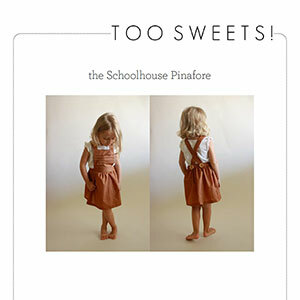 The Schoolhouse Pinafore is an incredibly versatile piece that can be dressed for all seasons. It boasts horizontal pleats, crossed straps, and a gathered skirt; features that keep it simple yet stylishly timeless. Perfect for school, church, or outside play, it's a piece your little one will absolutely love. This pattern is available in sizes 12 months through 12 years. 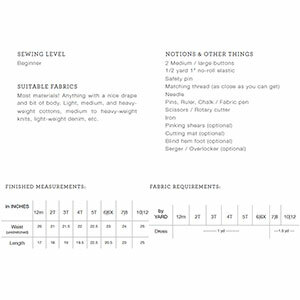 Suggested fabrics are light to heavy weight wovens such as crepe de chine, rayon challis, peach skin or lawn. Medium to heavy weight knit such as cotton jersey, cotton lycra, french terry or ponte de roma. Light to medium weight denim or stretch denim.